Dimensions 0.75 by 5.25 by 8 in. 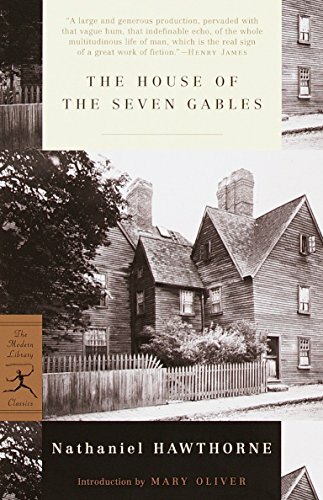 Amazon.com description: Product Description: First published in 1851, The House of the Seven Gables is one of Hawthorne's defining works, a vivid depiction of American life and values replete with brilliantly etched characters. The tale of a cursed house with a "mysterious and terrible past" and the generations linked to it, Hawthorne's chronicle of the Maule and Pyncheon families over two centuries reveals, in Mary Oliver's words, "lives caught in the common fire of history." This Modern Library Paperback Classics edition uses the definitive text as prepared for The Centenary Edition of the Works of Nathaniel Hawthorne; this is the Approved Edition of the Center for Scholarly Editions (Modern Language Association). It includes newly commissioned notes on the text.